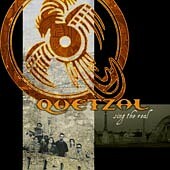 Quetzal is one of those bands that is difficult to define, and even more difficult to quantify. Part of the group’s sound is the sort of glossy pop that’s more befitting of a Sade album than anything from the rock world — a point that’s further exemplified by the slick, adult contemporary ambience of tracks like The Social Relevance of Public Art and Emotions. Sing the Real is available from Barnes & Noble.